I have to share a cute story with you. It happened this past weekend. I went to my daughter's Thursday night after work to spend the night with my granddaughter so she and her husband could have a night away together. Now, a few days before my daughter set up a small fish aquarium for Alivia. It wasn't until they were gone that I noticed that it wasn't anywhere in the living room. So I say to Alivia, who's only two, "Alivia, where's your fishy, baby? What did mommy do with your fishy?" I knew my daughter said she'd bought five little gold fish. Alivia looks at me quietly for a moment, looks over at the top of the sewing machine where I knew Michelle had placed the aquarium, then back at me. I ask her again where her fishy are. She crooks her little finger at me and then motions me to follow her. We go down the hallway toward my daughter's bedroom and I think to myself, oh, Michelle must have put the tank in her room. We enter the bedroom and I glance around but don't see one. Alivia, however, kept right on walking to the bathroom. By then I'm frowning and wondering why Michelle would put a fish aquarium in the bathroom. Then I broke out in a laugh when Alivia went straight to the toilet and pointed down into the water. I knew immediately what Michelle had done. Later when she came home I told her that Alivia squealed and told me what she'd done with the fish. Apparently the fish had died. But we all got a kick out of how Alivia tattle tailed on her mom without even saying a word! By the way, the picture was taken this past weekend. 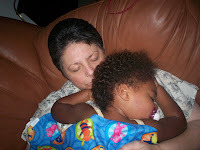 We were taking a nap and my daughter caught us in the act! Such a beautiful couple!!! I love great shots like this and the sotry is just tooo cute.